Author: Andreas E. Eckl. Series edited by: Michael Bollig, Wilhelm J.G. Möhlig. 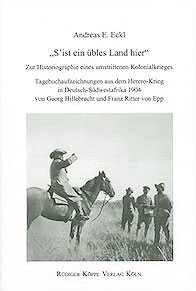 The present volume offers an insight into the diaries written by two German contemporary witnesses during the Herero war in German Southwestafrica of 1904. Over four years ago, the African Diary of Georg Hillebrecht came into the hands of the editor, Andreas E. Eckl. It was written during Hillebrecht’s service as assistant medical director in the colonial force. Both diaries – Hillebrecht’s and Epp’s – are genuine diaries, that means that they contain notes which stand in direct temporal proximity to the described situations and events. The notes are therefore free from later valuation or judgement. The entries of the diaries comprise two stages of the war, i.e. the time of the ‘real’ war that ended on August 11, and the conflicts afterwards. Therefore, they can be used as a basis for the question after the changed role and function of the colonial troops after Hamakari and the supposed change in the point of view of the soldiers regarding the colonial war, the estimation of one’s own role in this war and the self-image as a soldier of the colonial force. The two diaries of Hillebrecht and Epp are published together in spite of or even because of their differences in style and contents. They complement each other and illustrate the wide spectrum of personal and individual perception of the colonial war. On one side, there is a text full of observations, descriptions, impressions, opinions and reflexions, on the other, we have military brief and precise notes hardly without any personal remarks that record only the essential of the military perspective of a soldier. Exactly the composition of both texts make clear that a generalizing argumentation with a look on the role and the behaviour of the colonial force soldiers, cannot do justice to the historical reality and the diversity of the single characters. Als eine der besonnensten Stimmen in dem aufgeregten Gezeter um eine deutsche (Kolonial-)Vergangenheit, "die nicht vergehen will", ist Andreas E. Eckl zu nennen.